I was doing photometry on V1108 Her and decided to zoom into NGC 6671. I noticed it had a distinct center, but it also had a bright object on the outer edge. I am a beginner so I am just wondering if it is a Novae. I have checked the photos of NPC 6671, and there is no bright objects in those, but it is hard to be sure. The link to my photo is below, NPC 6671 is between the two brighter stars in the center. Any comments? I hope the photo is accessible, as it should have public access. 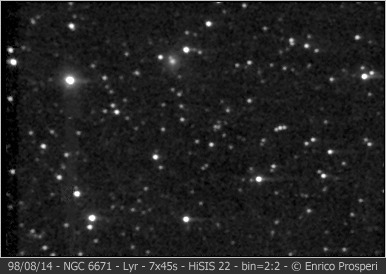 I checked an image of NGC6674 at CDS SIMBAD. I compared your image with SIMBAD's and could not confirm any new object. I also check http://www.rochesterastronomy.org/snimages/ and there are no recent supernova in NGC 6671.